Although female Nurses already served in the Union Army during the Civil War (1861-1865) and in the Spanish-American War (1898), they were never officially part of the United States Army! February 2, 1901 saw the formation of the Nurse Corps, which was to grow and expand rapidly, as the need for more medical personnel increased dramatically. There were 403 Nurses on active duty in 1917, and over 21,000 in 1945 (of which nearly half served overseas). For those not familiar with the US Armed Forces during WW2, it must be underlined that the A.N.C., the W.A.A.C. (later W.A.C. ), and the A.R.C. were totally different organizations! While the Army Nurse Corps and the Women’s Army Corps essentially consisted of female personnel, the American Red Cross did not, but there’s little comparison possible between the two first organizations. It should however be stated that W.A.C. members did serve as Medical and/or Surgical Technicians, after receiving the appropriate basic training. The establishment of the Army Nurse Corps on February 2, 1901 opened the door for women in the military, but it wasn’t until the U.S. Government got involved in World War 1 (April 6, 1917), that some parts of the Government and the Military became serious about using women in the Armed Forces. The Army never officially recruited women (the Navy did, after the formation of the Navy Nurse Corps in 1908), and with only a token cadre available had to rely on help from outside. As a result the American Red Cross, acting as a kind of reserve, was to supply quite a number of Nurses, who by consent, were assigned to active duty with the Army Nurse Corps. Additional women, such as Army Contract Nurses, YMCA/YWCA Volunteers, ARC Workers and others were to join on a voluntary basis. The Army tried, but in vain, to request that women serve as Administrative Clerks but this was rejected by the War Department. Consequently, the only women to serve with the A.E.F. in WW1 were Nurses! Army Nurses were sent overseas to Britain, Belgium, France, and Italy; they served on troop trains and transport ships. The very first Nurses, arriving on the European Continent, were assigned to the British Expeditionary Force, where they provided medical care at 6 Base Hospital units. While Nurses died from influenza and pneumonia, no Nurses lost their lives because of direct enemy action. They were usually stationed in Hospitals, in the rear, attending the huge number of casualties evacuated from the front lines. By March 31, 1918, there were 2,088 American Nurses in France. After WW1, the Government’s demobilization plan drastically reduced the number of Armed Forces personnel, and the A.N.C. only kept 851 members on active duty. In 1938, there were 600 Nurses in the Army. In 1939, the A.N.C. had no more than 672 members. In December 1941, there were still less than 1,000 Nurses. Volunteers who wanted to sign up with the A.N.C. had to be a registered Nurse with 2 years of Hospital training, and a citizen of the United States (citizens of Allied countries were also accepted). Army Nurses received little training, except in general military matters, but patient care quickly took precedence over training. Mid-1943, the Army started providing basic training for Nurses, i.e. a 144-hour program including, basic military training, administration, organization, sanitation, and ward and clinic nursing. By June 1944, outdoor training was increased, and training aids were introduced in order to provide for more realism. During the American build-up in Britain (May 1943), morale and welfare of E.T.O. Nurses received considerable command attention, since the majority of A.N.C. members were not a very happy group. Mostly young and homesick, the women found themselves lonely and bewildered in a strange country. Uniforms and work dresses were ill-adapted to the cold and damp climate, buildings where they worked and resided were old and minimally heated, there wasn’t enough work since Hospitals were only partially filled, and overall activities were not very interesting either. However a gradually expanding number of new Base Sections, Army Hospitals, Hospital Centers and Training facilities, filled idle time and acquainted Nurses more intensively with their military duties, while the American Red Cross furnished recreational facilities. Shortages and inadequacies in clothing would however continue to plague E.T.O. Nurses throughout WW2. Over 50% of the Nurses did NOT receive the olive-drab general service uniform introduced early 1943 (requested by the Surgeon General in September 1942) to replace the (prewar) blue dress in which most of them arrived in the Theater! The situation was to gradually improve during the later war years. Indeed, after D-Day, the situation changed dramatically; the flow of patients increased, the Nurses’ position was revised and their ‘relative’ rank changed into a ‘full commissioned’ status, T/Os were reviewed and adapted, promotion opportunities were amended and improved, and Nurses had meanwhile acquired practical medical experience in the field, and other general skills, otherwise unobtainable. Members of the Army Nurse Corps served in Theaters all over the world. They often had to live and work under trying conditions, treating others and suffering themselves from tropical illnesses and diseases, adapting to different climatic conditions. Moreover, Nurses had to cope with inadequate supplies and lack of adapted Theater clothing. Some came under fire, others were taken prisoner, and many had narrow escapes. Deaths were unavoidable, due to hazardous duty. 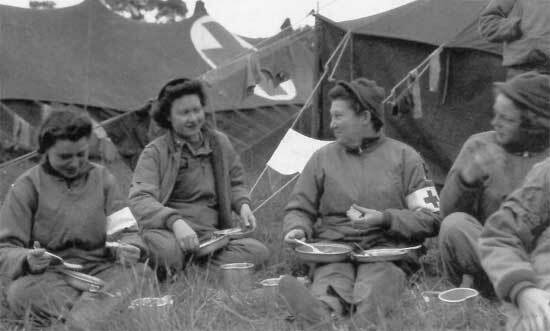 In total, over 59,000 Nurses served in the Army Nurse Corps during World War 2. They now worked closer to the front lines than they had ever before. Within the “chain of evacuation”, Nurses served under fire in Field Hospitals, Evacuation Hospitals, on Hospital Trains and Hospital Ships, and as Flight Nurses on medical transport aircraft. Their skill and dedication contributed to a lower post-injury mortality rate among the American military in every Theater of Operations. African-American Nurses were only gradually accepted, because of pressure groups and overall medical necessities, but since the U.S. Armed Forces were still segregated, this was never on a large scale. The tremendous manpower requirements faced by the U.S. Government during WW2 created numerous social and economic opportunities for American women – and both society and the military found an increasing number of roles for women. Women now served in many positions with the Armed Forces, either in direct or indirect support of military efforts. They were still excluded from active combat positions, but often worked in very difficult conditions, and risked their lives. Not only Nurses were on duty, in total about 74,000 women served in the United States Army and Navy Nurse Corps during WW2 (in total there were approximately 140,000 women in the Army, 100,000 in the Navy, 23,000 in the Marines, 13,000 in the Coast Guard, and 1,000 in the Air Forces). As large numbers of women entered industry and many other professions for the very first time, the need for Nurses (both in the Zone of Interior and Overseas Theaters) clarified the status of the nursing profession … Nurses were given Officers’ Commissions, retirement privileges, dependents’ allowances, and equal pay. Moreover the Government started providing free education to nursing students, as from 1943 onwards. At the end of WW1, it had already become clear that Nurses in fact needed Officer status – partly due to the fact that sometimes male medical orderlies refused to take orders from woman Nurses! According to Army Regulations, Army Nurses were ‘ranked’ above Sergeants and Corpsmen, however in practice, AR were little known in the field and no special badges were worn by Nurses to indicate rank or authority! Nurses would finally be given relative rank in 1920. The issue was laid to rest until it came up again in WW2. By then the Chief Surgeon was urging to give Nurses more rank too – as a result of Congressional action in 1942, Nurses received pay adjustment June 16, 1942. They were now entitled to pay and allowances equal to those of male Officers! Congress subsequently authorized promotion of Nurses to the relative ranks of Major and Lieutenant Colonel, whereas previously advancement had been limited to Captain! With well over 90% of ALL Nurses in 1942 holding rank of Second Lieutenant, (this gave them a certain protection in an ALL-male world of G.I.s) the Surgeon General, under political pressure to accelerate promotion (this would place US Nurses on a more equal footing with British Nurses who held full commissioned Officer status), increased the number of higher Nurse grades in Hospital T/Os, urged the various Theaters to fill these vacancies more rapidly, and set quotas for increasing the total number of Nurses above the rank of Second Lieutenant. One of the measures was to recommend for promotion to First Lieutenant, all properly qualified Nurses who met a Theater minimum requirement of 7 months in grade and 3 months in a single position with a performance rating of “excellent”. The overall increase of Nurses in rank above Second Lieutenant reached 4.4% in January 1944, became 11.6% in June 1944, and rose to 21% by November 1944. Congress, on June 22, 1944, finally granted Nurses full Officer status (including full retirement privileges, dependents’ allowances, and equal pay) for the duration of the War + 6 months. Corresponding Officer relative ranks (valid in the US Army) were obtained for members of the Army Nurse Corps.Nurses held the lowest Officer rank, equivalent to that of a Second Lieutenant – Chief Nurses had a rank equivalent to that of a First Lieutenant – Assistant Directors held a rank equivalent to that of a Captain – Directors had a rank equivalent to that of a Captain – an Assistant Superintendent had a rank equivalent to that of a Captain, a Major, or a Lieutenant Colonel – a Superintendent representing the highest Officer rank, held a rank equivalent to that of a Major, later upgraded to a Lieutenant Colonel, and finally to a Colonel. The overall current ANC rank structure in 1943 was: 1 Colonel – 22 Lieutenant Colonels – 54 Majors – 222 Captains – 2,056 First Lieutenants – and over 33,000 Second Lieutenants. As per AR 600-37 dated April 16, 1945, Women personnel of the Army, included ALL Officers of the Women’s Army Corps (WAC), Army Nurse Corps (ANC), Physical Therapists, Dietitians, Women Medical Officers, and Officers/Enlisted WAC personnel (except A.R.C. Workers and Staff Aides). 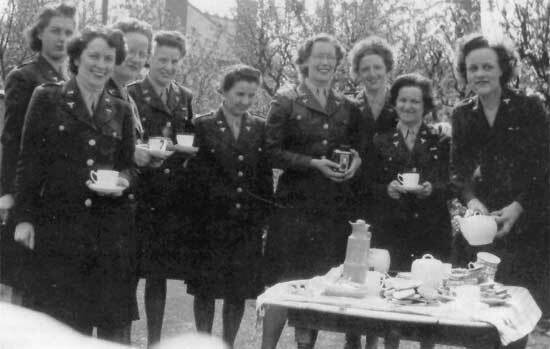 U.S. Army Nurses enjoying the amenities of British country life … all Nurses seem to wear the Wool Olive Drab Dark Shade No. 51 Winter Uniform, except maybe the woman to the right, which looks like she is wearing the One-Piece OD Winter Dress. Photo taken in Swindon, England, mid-April 1944. The 250th Station Hospital Nurses temporarily joined the “Nurses Provisional Battalion” at Swindon awaiting a change of Station. From L to R: Second Lieutenants Frances E. Dunning; Jean H. Duffy; Marie L. Lowe; Ann Heiser; Marion E. Castrodale; Faith A. Oldham; Gwyneth Edge; Doris M. Allshouse; Beatrice O. Patterson. 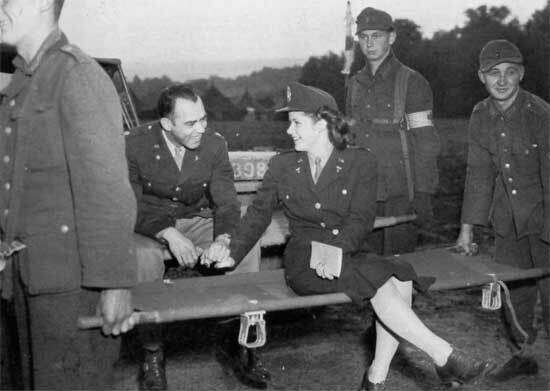 Army Regulations provided for a number of official Insignia for wear on Uniforms, while the Quartermaster issued Supply Catalogs and Supply Bulletins, listing the necessary Clothing and Equipment for WACs and Nurses. Should you want more information, please click here. U.S. – Nurses will wear block letters U.S. of gold-colored metal, 7/16 inch in height, each letter is to be followed by a period symbol. Insignia will be worn on both upper collars of the Service Jacket (Commissioned Officers). Insignia of Arm or Service – Nurses will wear the appropriate Insignia of Service on both lapels of the Service Jacket, i.e. the gold-colored Caduceus, 1 inch in height, with the letter “N” superimposed, 3/8 inch in height (either in bronze finish, or in brown enamel, later standardized in black). Insignia of Grade – Nurses (Officers) will wear the corresponding Rank on both shoulder loops of the Service Jacket, at a distance of 5/8 inch from sleeve end of loop. When the Waist is worn without the Service Jacket, the Nurse Insignia will be worn on the left side of the collar, whereas the Insignia of Grade will be worn on the right Waist collar. Nurses’ Cape: similar instructions will apply, i.e. A.N.C. Insignia (left) and Rank (right collar). 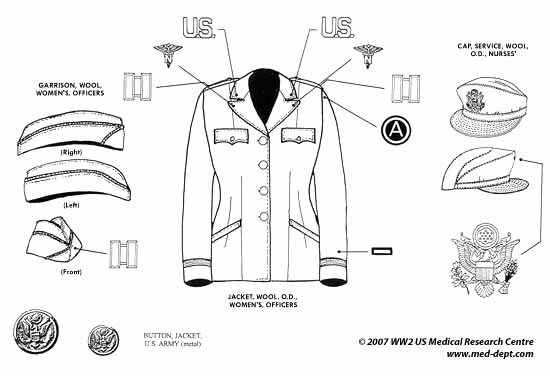 Illustration showing the placement of insignia and ornamentation on the Army Nurse Corps uniform and headgear. Nurses will wear the wool olive-drab Service Cap of adopted design, with stitched semi-rigid visor covered with same material, with front strap, and center grommet to accommodate the official gold-colored Coat of Arms of the United States 2 3/8 inches in height. When not available, or for field use, Nurses will wear the wool OD Women’s Garrison Cap, with the appropriate Officers’ braid of intermixed gold bullion and black silk, and the corresponding Officer’s Insignia of Grade, on the left of subject Cap. Women Medical Officers (not ANC) will wear the wool olive-drab Service Cap of adopted design, with visor and chin strap of Army Russet leather, with small regulation cap buttons, and one center eyelet to accommodate the Officers’ Cap Insignia. Above Officers could also wear the olive-drab Garrison Cap, with curtain finished with the gold-black Officer’s cord-edge braid and the specific Insignia of Grade. Army Nurses did not possess special accessories, such as Branch Piping, Armbands, Flags, or Guidons – except they did wear Utility Bags with Shoulder Strap as part of the Uniform (different design ANC and WAC). Lt. Colonel Florence A. Blanchfield, A.N.C., was made Acting Superintendent of Nurses in 1942. She was appointed Chief of the Army Nurse Corps, given Army Serial Number N-1, and officially commissioned in the Regular Army. Colonel (temporary ANC grade) Blanchfield served from 1943 to 1947, and retired after more than 29 years of active service. 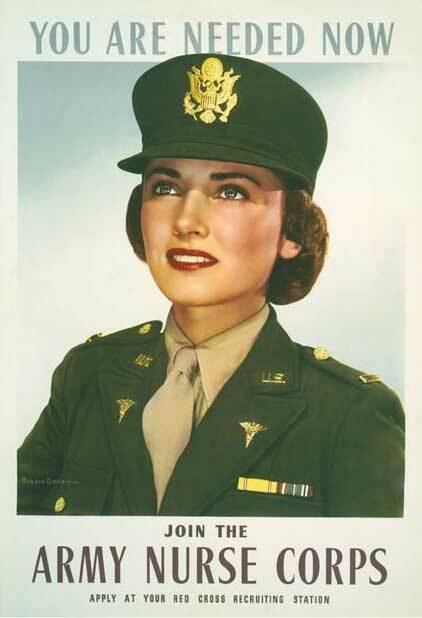 She was awarded the DSM in June 1945 for leading the Army Nurse Corps during WW2. 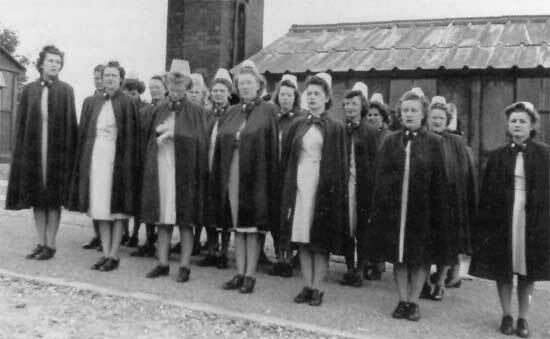 Picture showing a group of Nurses belonging to the 250th Station Hospital. Note the Nurses are wearing cotton Seersucker Uniforms with appropriate Caps, and are draped in what appears to be the old dark blue Capes. Photo taken in Grimsditch, England, end May, early June 1944, during Retreat. 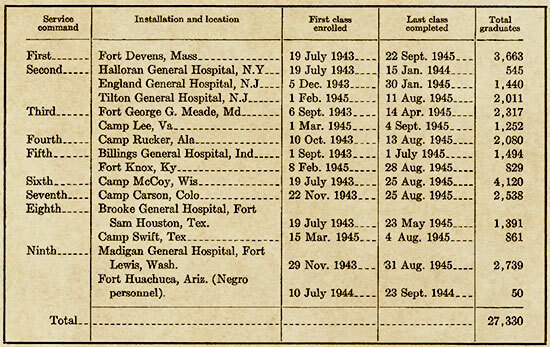 1945 Chart illustrating Basic Training Centers for Army Nurse Corps Officers and corresponding data. 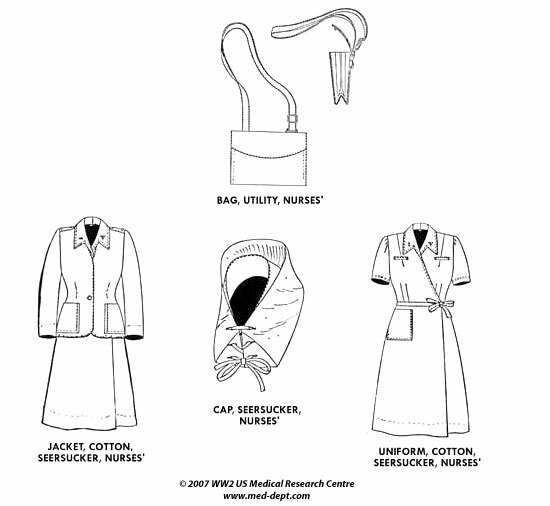 Illustration showing the general uniforms of an ANC Seersucker Nurse. Also illustrated here is the Nurses’ Utility Bag. There were more additional accessories, such as a transparent waterproof cover for the Wool Winter or Summer Cap, and another one destined for the Garrison Cap. The other items covered cloth, buttons, and respective cap and collar insignia. It was the responsibility of the QMC to make available all essential Items of Clothing to Women stationed overseas. Quartermaster Officers were to take all necessary measures to facilitate the supply of items to Nurses, WACs, Red Cross workers and other authorized personnel in overseas areas. All items of Clothing (see above descriptions) were available for sale to all Women authorized to purchase the goods. Items carrying the 99 Series of Stock Numbers were not regular Items of issue, and were thus only procured by the Quartermaster Corps in limited quantities! In case supplies or requisitions were insufficient, women sometimes were issued, or purchased, WAC items as a substitute. The above lists do not include Hosiery, Underwear, Nightwear, Footwear, General Clothing, Field Wear, and Accessories, such as Gloves, Handkerchief, Bandana, Necktie, Scarf, and Dress Shields, which were partly covered by Mandatory Clothing & Individual Equipment Allowances, and Mandatory and Optional Clothing Purchases (let’s not forget Officers had to purchase some of their clothing). For those interested in Women’s Clothing, it should be noted that the Women’s Army Corps (WAC), the United Services Organizations (USO), the Hostesses and Librarians, and the American Red Cross (ARC) workers, all had their own official Uniforms and Insignia. WW2 recruitment poster designed to encourage women to actively become involved with the Army Nurse Corps. Other women in uniform emerged from training and took their places at Army Posts, Army Airfields, and Naval Bases, dressed in khakis, blues, olive drab, greens, and grays, effectively releasing able-bodied men for combat duty. 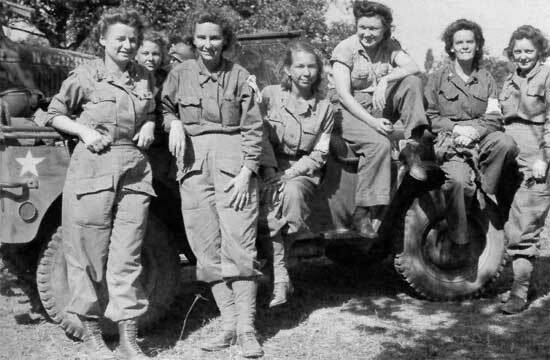 They belonged to the WAAC (established May 1942 – Women’s Army Auxiliary Corps), later replaced by WAC (established July 1943 – Women’s Army Corps), WASP (established August 1943 – Women’s Air Force Service Pilots), WAVES (established July 1942 – Women Accepted for Volunteer Emergency Service), and SPAR (established November 1942 – Women’s Reserve US Coast Guard).